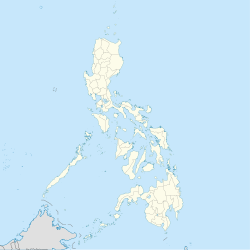 Mabini, officially the Municipality of Mabini, (Cebuano: Lungsod sa Mabini; Tagalog: Bayan ng Mabini), is a 4th class municipality in the province of Bohol, Philippines. According to the 2015 census, it has a population of 27,171 people. The town of Mabini, Bohol celebrates its feast on May 10, to honor the town patron Santa Monica. Established in July 23, 1904, through a resolution approved by then Governor General of the Philippines, the town of Mabini was initially composed of the three large barangays of Libas or Ubayon, Batuanon and Cabulao. The efforts of establishing those barangays into a town came from Capitan Canuto Bernales, General Pedro Samsom and Atty. Gabino Sepulveda when the Philippines Governor General issued a directive to organize large barangays into towns. Capitan Canuto Bernales, General Pedro Samsom and Atty. Gabino Sepulveda were friends and comrades-in-arms during the Filipino-Sapanish and Filipino-American revolutions. The idea of naming the town as Mabini came from General Pedro Samson and Atty. Sepulveda, in honor of the hero, Apolinario Mabini, the Sublime Paralytic and Brain of the Revolution . Then provincial Governor Aniceto Clarin handed over the approved resolution to Capitan Canuto Bernales who had to walk all the way to Tagbilaran City to receive it. The approved resolution he receive formally recognized the formation of the town of Mabini. Capitan Canuto Bernales became the first town president of Mabini. ^ "Bohol Festivals Timetable". "www.bohol-philippines.com". Retrieved 2019-04-03. ^ "Mabini Bohol Travel Guide". "www.bohol-philippines.com". Retrieved 2019-04-17. Wikimedia Commons has media related to Mabini, Bohol. This page was last edited on 17 April 2019, at 10:07 (UTC).